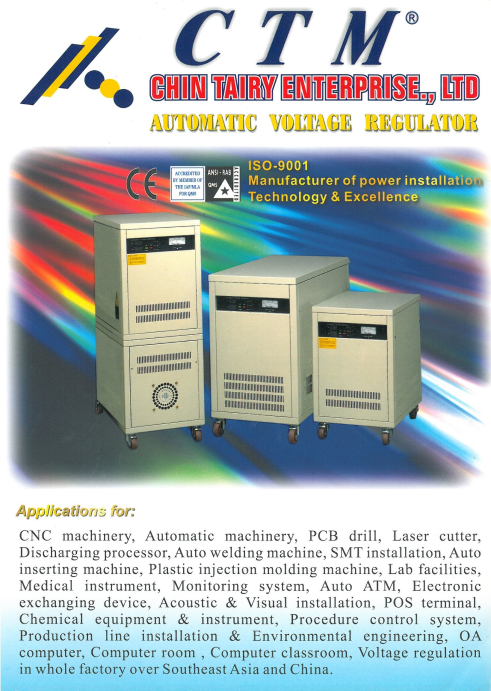 Automatic Voltage Regulator (AVR,Stabilizer)/Servo type automatic voltage regulator/ regulator (Three-phase Series)-Chin Tairy/ Yu Cheng Power Co Ltd.
1. Type of operation: Electronic control, magnetic or inducauce operation. 2. Tolerance of input deviation within +/-15%, +/-10%~20%, output volage +/-1%. For both voltage input and loading. 4.Response time: completed within 5 cycles. 8. Protection function: slow-up power device. Voltage-regulation Scope: Key in a rated voltage value ±15% (Take an example of 220V, it ranges from 187V to 253V) or ±20% or ±30%. Voltage-regulation accuracy: After regulation, the error value of voltage output is less than ±1% (For 220V, its error is around 2V). Roaction time: The voltage-regulation act start at 0.01 seconds, and within 0.1 seconds, the process is complete (a magnet-saturation type can be selected for even better speed). 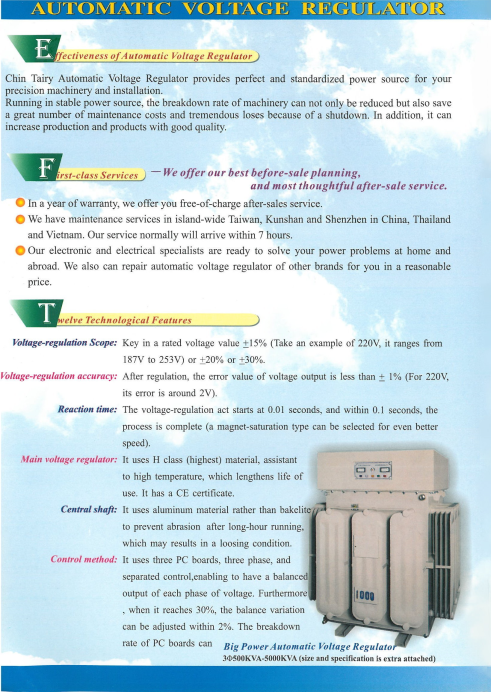 Main voltage regulator: It uses Hclass (highest) material, assistant to high temperature, which lengthens oife of use. It has a CE certificate. Central shaft: It uses copper material rather than bakelite to prevent abrasion after long-hour running, which may results in a loosing condition. Control method: It uses three PC boards, three phase, and separated control, enabling to have a balanced output of each phae of voltage. Furthermore, when it reaches 30%, the balance variat5ion can be adjusted within 2%. The breakdown rate of PC boards can therefore be reduced and maintenance costs can be saved later. Carbon brush upgraded: Carbon brush bars is replaced by carbon brush discs, which has even more stable slide to ensure quality of voltage regulation. Structured installation: LED displays conditions of the machine so everything is under control. It is also designed in a single device so the parts can be easily replaced. Overload capability: It allows instant overload over 150% for more than 10 seconds; instant overload over 200% for more than 2 seconds. Reinforced PC board: It uses two-layer fiberglass so moist, oil, and dust are not easily attached on the surface. It can also prevent poor contacts. Thoughtfulness: It uses a hidden voltage no-fuse switch to prevent inappropriate switch-off or manmade damage. Output efficiency: From nothing to full load, the output efficiency all can reach over 98%. The power consumption is less than 1% when there is no load (power factor is over 85%), which can save your electricity bill. Main voltage regulator: It uses general A class insulating material, only durable for 105°C. It is less safe and not so durable. Central Shaft: It uses bakelite or fiberglass, which is easily worn out. Carbon brush structure: Carbon brush is driven by a single iron sheet. ◎The remaining 4-12 items are the same with class H.
Instant electricity shutdown delay protection:Sudden blackout and resumption will produce extreme low or high pulse voltage, which may cause damage to machinery, especially to computers. This function will not let the device start until electricity resumes in a normal state. R.S.T phase-shortage protection:When there come typhoons, earthquakes, or lightening and any phase wire of the external power suddenly come short, it will stop power supply immediately to avoid damage to machinery. Excess high voltage protective function and abnormal wave function:When input voltage exceeds the range of voltage regulation, it will automatically turn off power source to prevent burning of machinery. Excess low voltage protective function:When input voltage is invaded by extreme low voltage, it will also automatically turn off power source so as not affect precision of installation. In this way, the equipment can last longer and cut down its depreciation. CPU monitoring function:Micro0computer (CPU) is used to conduct monitoring on the whole process, enhance various protective functions, and intercept abnormal power invasion in anefficient way. Output voltage adjustable:The output voltage of automatic voltage regulator can be adjusted as requirement in a range of ±10% to satisfy the application of various machinery. Overload protective function:If machinery uses rated capacity exceeding the automatic voltage regulator itself, it will automatically cut down the power source to ensure safety in application of electricity. 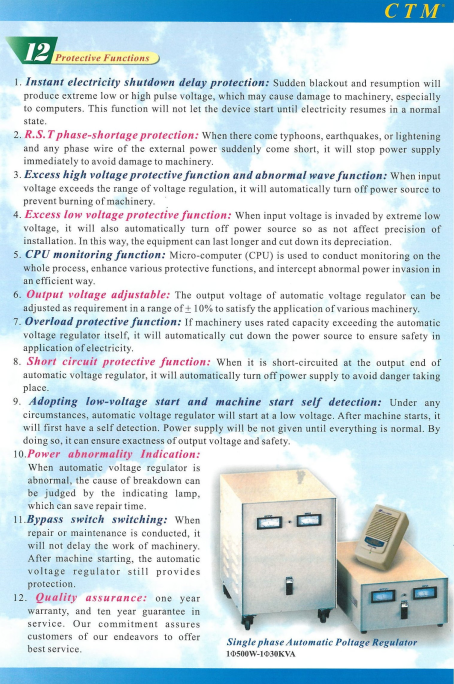 Short circuit protective function:When it is short-circuited at the output end of automatic voltage regulator, it will automatically turn off power supply to avoid danger taking place. Adopting low-voltage start and machine start self detection:Under any circumstances, automatic voltage regulator will start at a low voltage. After machine starts, it will first have a self detection. Power supply will be not given until everything is normal. By doing so, it can ensure exactness of output voltage and safety. Power abnormality Indication:When automatic voltage regulator is abnortmal, the cause of breakdown can be judged by the indicating lamp, which can save repair time. Bypass switch switching:When repair or maintenance is conducted, it will not delay the work of machinery. 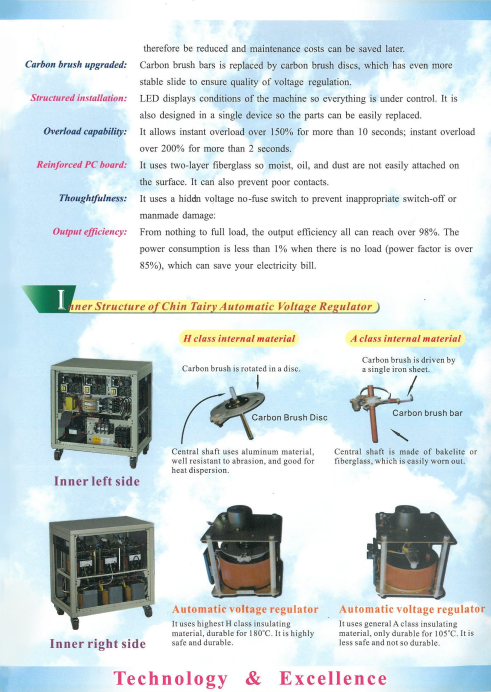 After machine starting, the automatic voltage regulator still provides protection. Quality assurance:One year warranty, and ten year guarantee in service. Our commitment assures customers of our endeavors to offer best service.